When I first entered the world of fly fishing I came from a lifetime of spin cast fishing. If you began fishing as I did, you probably started out with a Zebco 202 or if you were lucky, a Zebco 33. You gradually progressed to more advanced reels as you eventually realized that your starter reel no longer performed the tasks that you required from it. I think that this is probably a universal story for most of us who did not grow up in the midwest where fly fishing is the norm. It took me some time to realize this but one of the most difficult transitions that I would make from spin cast fishing would not be learning to cast or becoming acquainted with the new equipment. It would be getting out of the ‘spin cast mindset’ that I had developed over the years and learning to look at fishing from a different point of view. One of my first clashes with this mindset came when choosing my first reel to buy. How in the world could I make a good choice when I had never even held a fly reel before? What should I be looking for, which features were unnecessary for my needs and how much money should I spend in order to buy a reel that I wouldn’t outgrow? 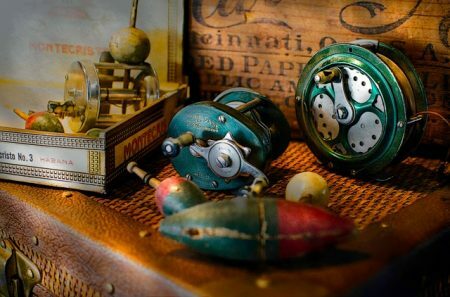 If you care considering your own first fly reel, or maybe your tenth, I would like to point out some thoughts that, as a spin cast fisherman, may go against everything that you’ve come to believe concerning fishing reels and their features. The good news is that if you can accept these suggestions then you will not only save yourself a lot of money but also a lot of frustration. The first thing to understand is that unless you are fishing for very large fish, (musky, steelhead or saltwater species), the reel does nothing more than to hold your line. That is its only function. You will cast with the line that you strip off of it and you will bring in your line (with a fish or without) by stripping it in. This is drastically different from a spincast reel that not only casts your line but also brings it back in. This simple contrast makes a world of difference when deciding which fly reel to buy and here is why. Fly reels do not need to have an ever growing number of ball bearings and highly tuned gears in order to be functional. In fact, I’ll add to that by saying that they do not even require elaborate drag systems assuming that you are looking for a 6 weight reel or smaller. The fact is that you can create your own drag manually by either palming the reel and adding resistance to it as the line comes off or by allowing the line at your feet to slip through your stripping hand. Unless it is a very large fish, you will often not need any drag at all. The fly rod does a tremendous job of acting as a shock absorber and wearing the fish down for you, without breaking off your line. Before anyone reads this and becomes extremely upset at the above paragraph, let me restate again that this logic assumes that you are not fishing for large game fish, in which case a good drag is highly important. However, the truth is that you do not need a sealed, ceramic, disk drag on a 4 weight fly rod that you are using to fish for 12″ trout. It is honestly something that you will never need or use. So what is important in the average fly reel? After all, they vary in price from a few dollars to several hundred. The integrity of the reel itself is important. You don’t want your first reel to break the first time that you slip on a rock and smack it against the ground. For this reason, you should stay away from cast reels. Casting is the pouring of hot metal into a mold in order to form the reel. This process creates a weak reel with small air pockets in the metal that can lead to it cracking or breaking. Unless you are severely limited in your budget, you should only be looking at machined reels. These reels are cut from a solid block of metal and eliminate all of the inherent weaknesses of a cast reel though they will typically cost a little more money. This is a far more important upgrade, however than worrying about the drag system or how many ball bearings the reel may have. Since we are less concerned about the drag on our first reel, it may be helpful if you choose one that has the spool exposed, instead of a spool that is enshrouded in the reel’s frame. If you can turn the spool with your hand (without using the reel handle) on at least one side of it, you can palm the reel and create your own drag if it should become necessary. If you wish to upgrade again, beyond the manner in which the reel is made, then begin thinking about the drag system. If you are expecting to be catching bass or larger trout or even crappie, you will most likely settle on a 6 weight reel. This is the middle, general purpose sized reel in the fly fishing world and it is a great place to start when choosing your first one. In a reel of this size, it is not inconceivable that you might intentionally or unintentionally hook a larger fish. A sealed drag is just that, it is sealed (usually by the placement of O-rings) in order to keep water and debris out of the drag system. This might be a reasonable step-up in your reel, finances permitting. One last word about the drag, even if you are willing to accept any kind of a drag that happens to come with your reel. Read reviews on your chosen reel and try to discover if the drag knob is one of the annoying ones that is so loose that it can accidentally turn without you knowing it. These can be a constant distraction and they exist on even the more expensive reels. The drag knob should be able to hold its setting without turning one way or the other, every time it makes contact with something. When I began this article, I said that the most difficult challenge for me to confront was my set way of thinking that I had developed concerning spin cast gear. 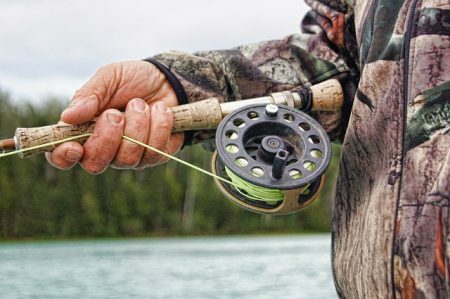 My point is that unlike spin cast fishing, where you quickly find yourself forced to spend more and more money on more and more elaborate reels, the same is not true in fly fishing. Assuming that you focus on the basics when you choose your first fly reel, the reel will always be a functional part of your arsenal. Even a plastic fly reel (assuming it doesn’t break or crack) will be just as functional for you ten years from now as it is the day that you took it out of the box. 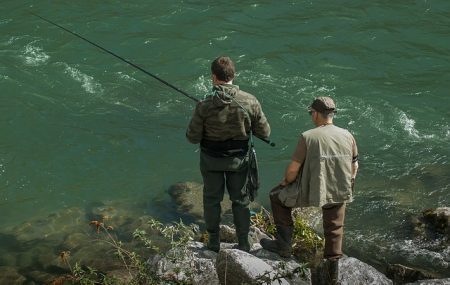 If you are like most of us, you will eventually end up buying more expensive reels as time goes by but you will do so because you want to, not because you need to, and this is a very important distinction between fly fishing and spin cast fishing. With a basic understanding of the fly reel’s function and how it is made, you can easily pass your first fly reel down through your family and let your children enjoy the same reel, long after you are finished using it.